Back to the Soil • Clarion left its mark on Utah's past and, more so, on a people's future. 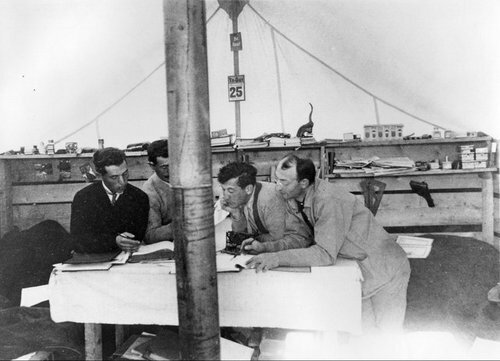 Men work to survey farm boundaries at the historic Clarion colony, which was founded 100 years ago as a Jewish farming community n Residents of the historic Clarion colony review the colony's books. 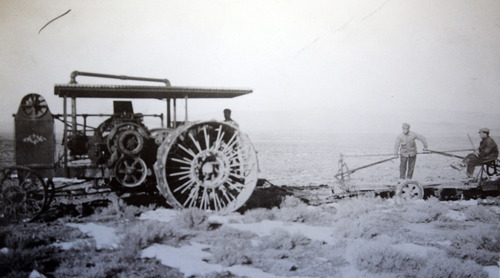 Clarion was founded 100 years ago as a Jewish farming communit Tribune file photo Circa 1912/1913, a tractor used by Jewish settlers at Clarion. The tractor failed to continually work for the s Tribune file photo Circa 1911, the first Jewish settlers before heading west by train. Clarion was the work of Jewish settlers in Tribune file photo Circa 1911, the original camp that was the beginnings of Clarion. 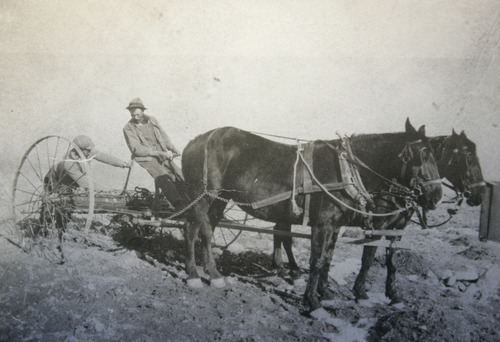 Clarion was the work of Jewish settlers in th Tribune file photo Circa 1912, Clarion settlers use horse drawn farming equipment. 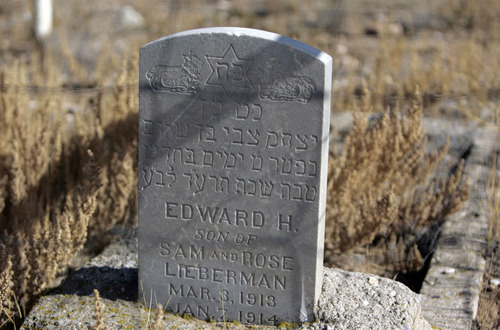 Sitting is Russian Jewish immigrant Aaron Bind Tribune file photo The headstone of Edward H. Lieberman marks where the Clarion settlement once stood. 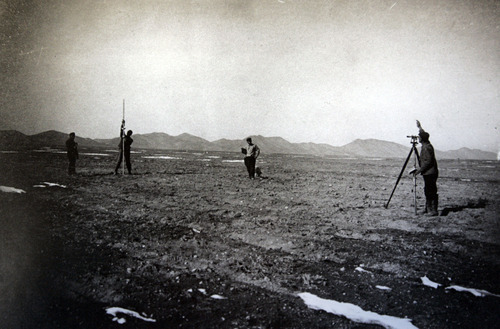 Tribune file photo Circa 1912, Jewish settlers survey land that became Clarion. At right is Russian Jewish immigrant Isacc Herbst. One hundred years ago, dozens of Jewish families did something that would have been unthinkable for many of their ancestors. They left crowded East Coast cities and trekked westward, to central Utah, to farm. It was an attempt at agricultural living  among a people not known as farmers  that drew more than 250 people over a five-year period to a settlement near present-day Gunnison. That settlement, called Clarion, may not have existed long, but many want to ensure its legacy continues to flower. 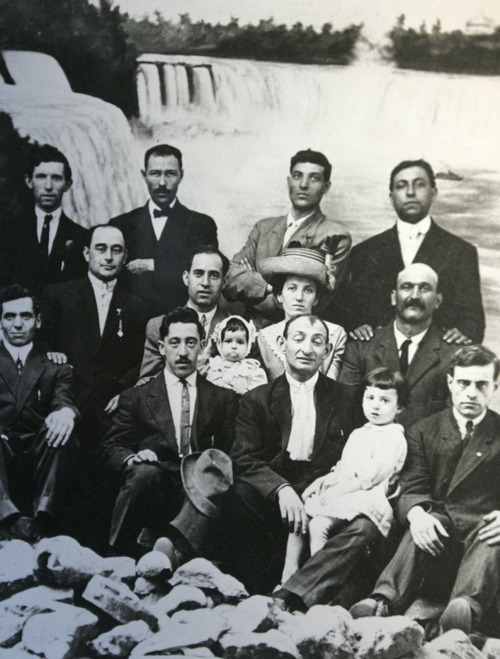 That's why members of Utah's Jewish community, descendants of the settlers and others plan to gather in Clarion this weekend to commemorate the 100th anniversary of its founding. "So many of our ancestors went and lived in cities," said University of Utah history professor Bob Goldberg, who wrote a book about the colony called Back to the Soil: The Jewish Farmers of Clarion, Utah, and Their World. "They lived on the lower east side. They lived in Chicago and Philadelphia. This small group of people that went off to the land are basically unheard of." Though few people know that a Jewish farming community once existed in Utah, the colony was part of a worldwide movement. Goldberg noted it was one of about 40 such U.S. settlements founded as part of the Back to the Soil movement. The idea was to change long-held notions about Jews and Jewish life. For many of the settlers, who were originally from Eastern Europe, it marked a chance to try a way of living that their ancestors were barred from experiencing. "Jews had been denied the ownership of land in Eastern Europe, so one of the ideas was in order to normalize Jewish life, Jews cannot only be businessmen ... they can also be farmers," Goldberg said. "In order to have a balanced society, Jews must also have the opportunity to till the land." Ben Brown, a Jewish immigrant from what is now Ukraine, spearheaded the effort to build a colony in Utah in 1911. 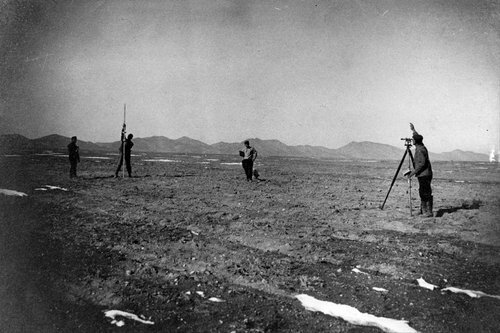 After moving to the United States, Brown worked on farms back East, and he felt working the land afforded Jews a chance to better their lives, Goldberg said. He persuaded others to join him. "He was a person with a lot of charisma, and he got this colony organized," said his daughter, Lillian Brown Vogel, who will turn 102 this weekend. 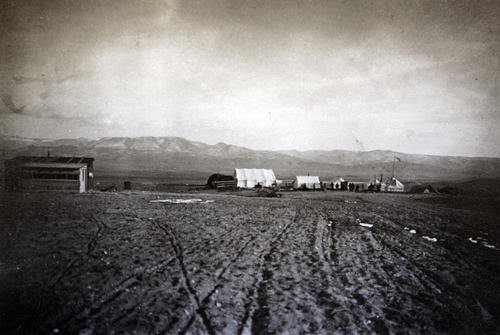 Brown chose to go Westbecause the land was cheaper, and Utah was far enough from Eastern cities to make settlers think twice about changing their minds and returning home. Plus, Goldberg said, Utah offered the best land, and Salt Lake City already had a Jewish population that could extend support. The first 12 settlers arrived in September 1911 ready to begin their new lives. They named the place Clarion, having answered a clarion call to move toward an agrarian life. But things didn't go as well as they had hoped. The land was rocky, dry and sloped, leading to erosion.During the settlement's first year, the banks of its canal broke. The next year, a massive rainstorm flooded the fields, which also fell victim to early frosts. As a small child, Brown Vogel remembers a tremendous boom awakening her one night. It was the sound of the cistern breaking  one of many factors, some social and some physical, that led to the deterioration of the colony. Eventually, with the settlers unable to pay off their debt on the land, the state foreclosed, Goldberg said.By 1916, most of the settlers had gone, though about 12 families stayed near Clarion and continued to farm until the late 1920s. In the strictest sense, the colony flopped. But in many ways, the Jewish settlers achieved what they set out to do. They lived a pastoral life, however briefly. Brown Vogel, who now lives in Northern California, still remembers her family's one-room cabin and the ditch out back where her mother bathed her. She remembers a joke between her and her father that arose from a minor accident. She and other children were riding in the back of a horse-pulled buggy on their way to a picnic when she fell out, splitting her lower lip. After the accident, her father kept asking her in Yiddish, the language of the colony, how her mouth was feeling. In Yiddish, she would reply, "I can't tell you because my lip hurts too much." Nearly 100 years later, she can still feel the lump in her lip. And some of the fruits of her father's labor remain. After Clarion, he went on to co-found the Central Utah Poultry Exchange, which evolved into the Intermountain Farmers Association, known as IFA. The colony also succeeded in other, more intangible ways. Its legend lived on through the stories passed on by settlers to their children and grandchildren, inspiring them. Beryl Rosenstock grew up listening to her dad  whose father, Samuel Lezitsky, was one of the original settlers  talk about life in the colony as a small child. He painted a romantic picture of the West that made Rosenstock think of her father as a sort of cowboy. It was only after she grew older that Rosenstock began to understand the weight of what her grandfather had done. "Even though they failed, it was really a very noble and courageous thing that they did, and I will always be enormously proud of that," said Rosenstock, who lives in Philadelphia. "It's a history I have passed down to my children and intend to tell my grandchildren." She said her grandfather's courage and adventuresome spirit have influenced her family's approach to life. "We see the world as a place that we can make better by our own actions, which is one of the things I think my grandfather was trying to do." Rosenstock and Brown Vogel plan to be among more than 90 people expected to attend the anniversary events this weekend. On Friday, the two women, along with others, spoke at a reception at the I.J. and Jeanné Wagner Jewish Community Center in Salt Lake City. On Saturday, they and others will journey to the Clarion site and Gunnison, where they will view a play about Clarion, attend a dinner hosted by a Mormon stake and discuss what they see. Now, all that remains of the site are foundations of homes, the schoolhouse and the walls of the cistern. Goldberg said two gravestones, inscribed in Hebrew, also remain on the burial spots of a baby and a man in his late 20s, a member of the colony who died when he was crushed bringing timber down from the mountains. Many are determined to preserve Clarion's physical markers and its spirit. "Clarion cannot be remembered simply as a failure," Goldberg said. "What makes Clarion important is its legacy. These Jewish men and women looked beyond themselves and their individual needs. They dreamed and struggled and sometimes died in hope of transforming a people and raising them to a better life." 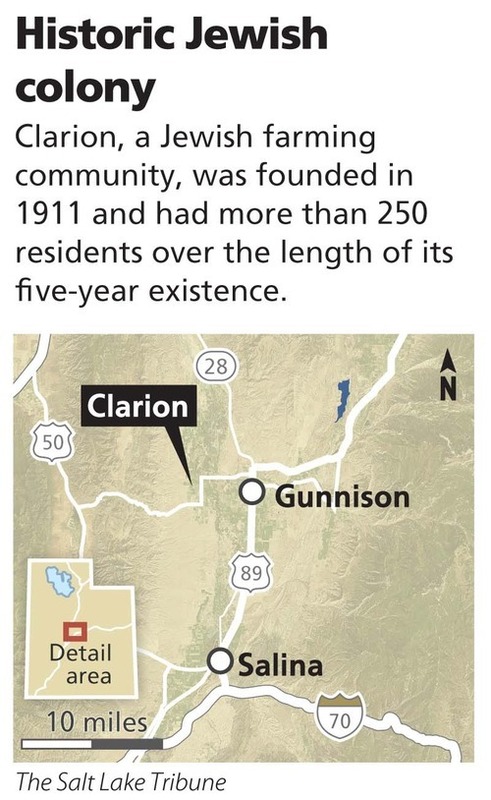 On Saturday, those who made advance reservations will journey to the Clarion site and Gunnison, where they will learn about the lives of Clarion's past residents.